New Multi-View Input Screens allow the user to select between screen layouts that display four, five or six inputs. When set up with four or five preview windows, the preset video thumbnails become larger on the bottom of the screen. In addition the Preview and Program windows can be swapped on the multiviewer output. 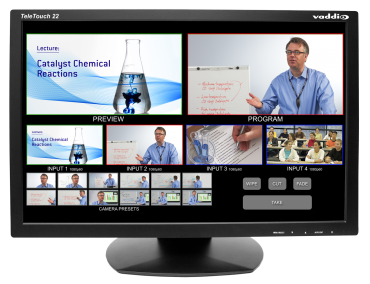 With Vaddio’s™ TeleTouch™ touch screen monitors, all live video feeds can be selected and up to 12 video thumbnail presets can be created, recalled and stored by simply touching the monitor. The thumbnails are a snapshot of what the camera preset shot looks like, to make storing and recalling presets even easier. Simply touch a thumbnail and the camera will pan, tilt and zoom to that position. The Cut, Wipe and Fade buttons illuminate on the multiviewer display, giving a visual indication of which effect is active. An additional capability of the system is Dual Bus Multiview output. This allows the user to switch between Preview and Program as discrete outputs – with one going to an IMAG Projector and the other going to a recording device. 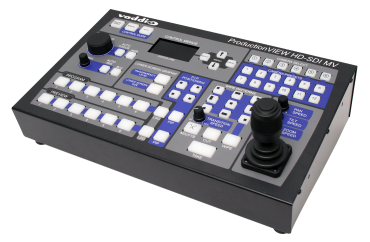 All inputs are autosensing for video resolution, control and camera type. 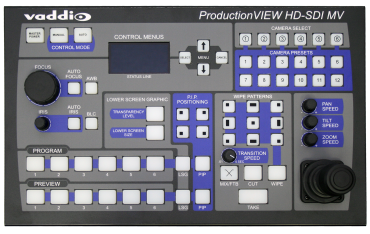 Video inputs include five HD-SDI/SDI (480i to 1080p) inputs on BNC connectors and a single DVI-I input on channel six that allows for multiple formats (DVI-D, YPbPr, RGBHV and HDMI) with 36 additional input resolutions. TeleTouch 22" HD Touch-Screen LCD Monitor with Base Touch screen LCD monitor with base. 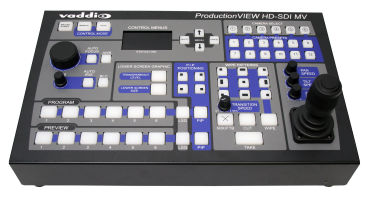 Works in conjunction with the ProductionVIEW HD MV and ProductionVIEW HD-SDI MV's built-in multiviewer. 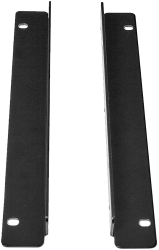 ProductionVIEW Rack Mount Ears 6-RU rack mount ears fit all ProductionVIEW consoles other than ProductionVIEW Precision Camera Controller.